(CNSNews.com) - The U.S. Treasury hauled in a record of approximately $1,084,840,000,000 in tax revenues in the first four months of fiscal 2017 (Oct. 1, 2016 through Jan. 31, 2017), according to the Monthly Treasury Statement released today. That is up about $5,616,000,000 in constant 2016 dollars from the approximately $1,079,224,000,000 in constant 2016 dollars that the Treasury collected in the first four months of fiscal 2016. Tax revenues from previous years, as reported in the Monthly Treasury Statement for January of each year, were adjusted to 2016 dollars using the Bureau of Labor Statistics Inflation Calculator. Despite collecting a record $1,084,840,000,000 in tax revenues in the first four months of this fiscal year, the federal government turned around and spent $1,241,780,000,000 in those same four months—and ended up running a deficit of $156,939,000,000. In January alone, the Treasury collected approximately $344,069,000,000 in tax revenues. 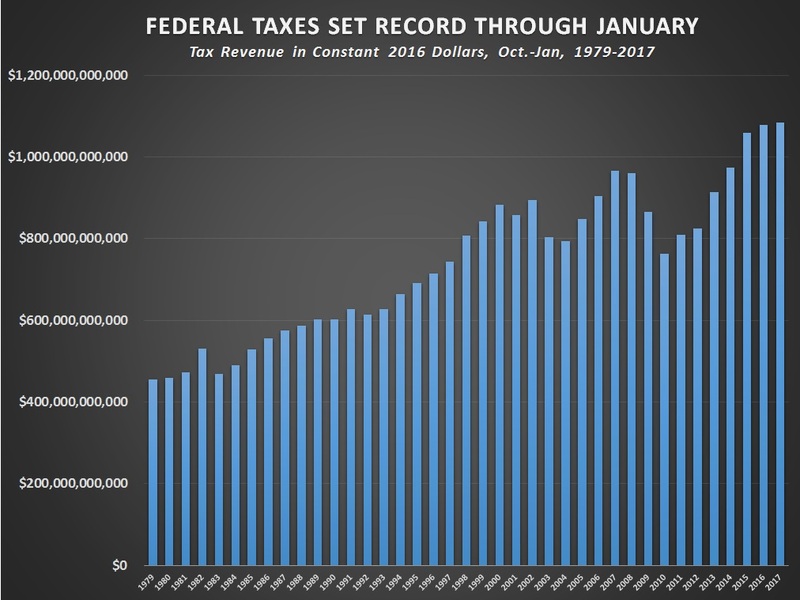 The largest portion of the $1,084,840,000,000 in federal tax revenues in the first four months of this fiscal year came from the individual income tax, which yielded approximately $550,068,000,000. The second largest portion came from Social Security and other payroll taxes, which brought in approximately $361,887,000,000. The income taxes collected from corporations in the United States in the first four months of the fiscal year ($84,877,000,000) amounted to more than 7 times as much as the customs duties collected on foreign imports brought into the country ($11,779,000,000). According to the Bureau of Labor Statistics, there were 152,081,000 people employed in the United States in January. That means that the record $1,084,840,000,000 in taxes the federal government collected in the first four months of the fiscal year equaled about $7,133 per worker.